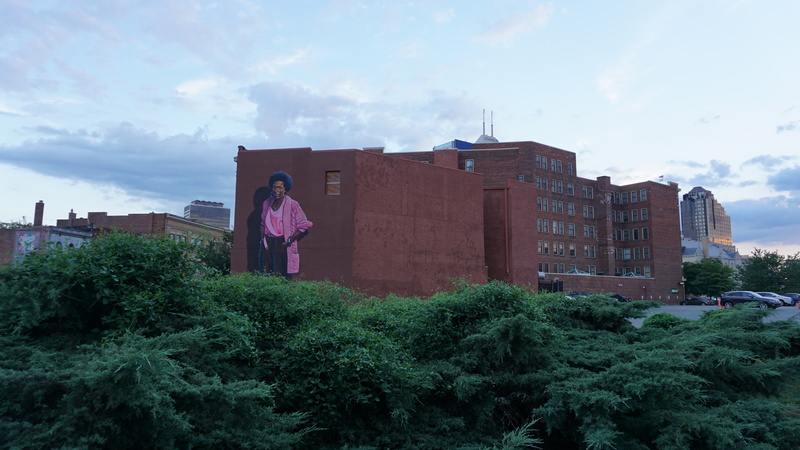 Several cultural and community partners worked together to complete a mural honoring Indianapolis-based poet and artist, Mari Evans — one of the founders of the Black Arts Movement. The mural is located at 448 Massachusetts Ave. on the southeast end of the historic Davlan. Evans selected artist Michael Jordan, aka ALKEMI, to paint the large, photo-realistic portrait. The project is funded by a grant from The Indiana Arts Commission as part of the Indiana Bicentennial Celebration and with support of The Efroymson Family Fund and in partnership with Riley Area Development. Born in 1919 in Toledo, Ohio, Evans has called Indianapolis home since 1947. See pictures of the mural in process and completed here. Read coverage by The Indianapolis Star, USA Today (via The Star), and NUVO — also a Best of Indy editors’ pick. A Mural of Mari Evans from Big Car Collaborative on Vimeo. Big Car chose the historic Davlan building for the mural’s location due to the high traffic of the area and its proximity to a mural of Evan’s contemporary, Kurt Vonnegut. Eric Strickland of Riley Area Development, which owns the building, views the mural as an important addition to Mass Ave, “It ensures that culture and diversity remain an important aspect of the district,” says Strickland. Another partner on the project is the The Links, Incorporated. “We the members of the Indianapolis Chapter of Links have long been admirers of Mari Evans—she leads with excellence and serves with grace….Indianapolis is blessed to have someone of her character and talent among us, ” says president of the Indianapolis chapter of the organization, Jarnell Burks-Craig. The Links is a volunteer service organization of concerned, committed and talented women who, linked in friendship, enhance the quality of life in the larger community, is concerned primarily with enriching, sustaining and ensuing the identities, culture and economic survival of African-Americans and persons of African descent. In addition to the mural, Big Car commissioned an art exhibit from artist Carl Pope related to Evans work that opened Nov. 5, 2016 at Tube Factory artspace. Mari Evans’ mother passed away when Evans was 10 years old. Her father immediately felt the need to encourage her in any way he could, cultivating her talent of writing that would later serve as her main career focus. After attending public schools in her hometown of Toledo, Ohio, Evans attended the University of Toledo in the 1940s where she studied fashion design, but left without a degree. Her interests shifted to writing poetry and by 1969 she was a writer-in-residence at Indiana University where she taught courses in African American Literature. Her books for children include “Dear Corinne, Tell Somebody! Love, Annie: A Book about Secrets” (1999), “Singing Black: Alternative Nursery Rhymes for Children” (1998, illustrated by Ramon Price). Evans also served as a consultant for the National Endowment for the Arts from 1969 to 1970. She published two collections of her poetry, “Nightstar: 1973-1978” (1981) and “A Dark and Splendid Mass” (1992). In 1984, she edited the first significant collection of black women’s poetry – the groundbreaking Black Women Writers (1950-1980). A new book of poetry “Continuum” was released in 2015. Evans has taught at a number of other institutions including Cornell, Northwestern, Washington University in St. Louis, Spelman College, the University of Miami at Coral Gables, and the State University of New York at Albany. But she is best known for her poetry with her work has appearing in more than one hundred anthologies. Most of that work focuses on the celebration of Africa and the struggles of the Civil Rights Movement as well as other themes bringing to light the reality of the African American experience. These projects were largely influenced by close friend Langston Hughes, who pushed Evans to write with confidence and to evolve into a well-respected figure in the Black Arts Movement of the late 1960s and early 1970s. The most important of her countless awards for writing came in 1981 when she received the National Endowment for the Arts Creative Writing Award. Jordan is a professional artist and poet living and working in Indianapolis for over 40 years. Norman Rockwell and Salvador Dali are among his influences and he has completed over 40 murals, including one for the Arts Council of Indianapolis’s 46 for XLVI. Jordan’s work has been part of both group and solo exhibitions at the Cincinnati Museum of Natural History, Indiana Black Expo Fine Arts Pavilion, Crispus Attucks African American Museum, Jefferson Gallery, Central Library’s Meet The Artists, Athenaeum, the Indianapolis Museum of Contemporary Art, etc. He has lectured at Indiana University, Purdue University- Indianapolis, several high school and is a published writer. The Links, Incorporated is an international, not-for-profit corporation, established in 1946. The membership consists of nearly 14,000 professional women of color in 280 chapters located in 41 states, the District of Columbia and the Commonwealth of the Bahamas. It is one of the nation’s oldest and largest volunteer service organizations of extraordinary women who are committed to enriching, sustaining and ensuring the culture and economic survival of African Americans and other persons of African ancestry. The Riley Area Development Corporation is a Community Development Corporation (CDC). CDCs are catalysts for community-led neighborhood rebirth through housing revitalization, economic development, and partnerships with crucial self-sufficiency programs. CDCs maximize public funds through alliances with financial institutions, equity investors, and individual donors. Committed to helping neighborhoods direct their own economic destiny, Riley Area believes in long-term revitalization of urban neighborhoods.